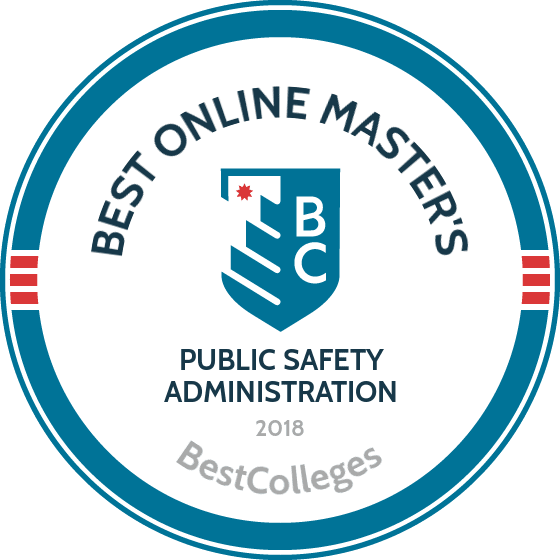 WHAT ARE THE BEST ONLINE MASTER'S IN PUBLIC SAFETY ADMINISTRATION PROGRAMS? What Else Can I Expect From an Online Master's in Public Safety Administration Program? There are numerous public safety agencies at the local, state, and federal levels that require effective administrators. Earning an online master's degree in public safety administration prepares you for a rewarding career while also enabling you to serve the public good. Graduates of public safety administration programs can go on to work in environmental protection, law enforcement, and occupational health. Public safety administrators may also find themselves in life-saving positions at disaster relief organizations and emergency management agencies. The U.S. Bureau of Labor Statistics projects a 7-13% increase in demand for public safety professionals by 2024. Created for professionals already working in law enforcement, USD's online master's degree in public safety administration can help motivated individuals advance to leadership positions in their field. Typically, students complete the 31-credit program in five semesters, or 20 months. Coursework is delivered asynchronously, allowing law enforcement professionals to maintain their jobs while earning their degrees. Interesting courses in the program include conflict resolution, community engagement, and communication for law enforcement leaders. Classes are administered in three 14-week semesters each year, with students taking only one seven-week course at a time in order to focus their energies in a single area. The program consists of 10 three-credit courses and a one-credit capstone project. All applicants to the program must have earned at least a 2.75 undergraduate GPA, and experience working in law enforcement or public safety administration is preferred. Arizona State's Skysong initiative — a department that focuses on innovation and economic development — created the school's online master's in public safety administration program. Students in the program complete a total of 33 credit hours that are delivered through 11 online courses, each lasting 7.5 weeks. Courses in the program include public policy analysis, geographic information systems, and organizational behavior. Every course is delivered asynchronously, and students can begin their studies in the fall, spring, or summer terms. Graduates of ASU's MA in public safety administration program are prepared to work in law enforcement, fire safety, and emergency medical services. Students in the program must complete a capstone project, which allows them to gain hands-on experience solving real-world problems in the public safety field. All applicants to the program must have earned a minimum 3.0 undergraduate GPA in a relevant field, such as public safety, criminology, or social work. The public safety administration degree at St. Thomas prepares working professionals for supervisory roles in police departments and other public safety agencies. Over 20 of the program's alumni currently work as police chiefs in the state of Minnesota. The online degree is taught in a synchronous format, meaning students take classes as a cohort at a scheduled time. Coursework in the program includes studies in public safety law; communication, conflict, and decision making; and federal and national policy making. Students take one eight-week class at a time over the course of two years. All applicants must have earned a minimum 2.75 undergraduate degree, and must submit GRE, MAT, LSAT, or GMAT scores. If students pass the first round of admissions screening, they will interview with member of the school's public safety administration department. Lewis University created its online master's in public safety administration so that law enforcement professionals can effectively apply principles of risk management and crisis intervention at the local, state, and federal levels. The 36-hour program makes use of asynchronous learning so that students don't have to give up their careers while they go back to school. The typical part-time student can finish the program in approximately two years. Lewis' curriculum centers around three areas: public safety administration and management; public safety law and civil liability; and public safety administration incident command. Students also learn research methods to measure and evaluate the effectiveness of public safety programs. Graduates of the program are prepared for jobs in law enforcement, homeland security, and emergency management. Applicants must have at least five years of relevant experience, a bachelor's degree in a related field, and a minimum undergraduate GPA of 3.0. SIU offers an accelerated master's in public safety administration degree that allows students to earn a diploma in as few as 16 months. The program is intended for those who already have a bachelor's degree in a related field and who have several years of work experience in emergency services. Since the degree blends the study of public safety administration with homeland security management, the curriculum includes courses in areas such as terrorism, weapons of mass destruction, emergency management, and public policy. Coursework in the 39-credit program is delivered asynchronously. Students who have graduated from the National Fire Academy Executive Fire Office, or who are already work in public safety, only need to complete 31 credits. The curriculum concludes in a practicum exercise that gives students a taste of life as a fire, emergency services, or homeland security professional. The content of an online master's degree in public safety administration will vary depending on which school you choose and the strengths and specializations of each program. The curriculum, faculty, and resources at each school can be important factors when choosing the program that's right for you. While course catalogs will differ from school to school, below is a list of sample courses that are common for most public safety administration degrees. Human Resource Management: In this course, you will study personnel systems in public sector organizations along with conflict management, business ethics, and workplace collaboration. You will also learn how organizations utilize their human resources programs and learn about typical management responsibilities such as employee relations, compensation, benefits, and performance. Public Safety and Incident Response: Public safety administrators must respond to a number of situations including public health emergencies, terrorist attacks, and natural disasters. Administrators must have the skills to lead first responders and disaster relief efforts. In this course, you will learn how to implement leadership strategies and work under the pressures of an emergency situation. Public Safety Law and Civil Liability: Students in this course learn about the relationship between the law and public safety efforts. As professionals in leadership roles, administrators must understand the responsibilities and liabilities of public safety personnel. The course uses historically significant lawsuits, cases, and precedents to illustrate important legal principles. How Long Does it Take to Get an Online Master's in Public Safety Administration? Online public safety administration degrees can usually be completed in two years and require an average of 36 credit hours of coursework. Enrolling part-time will lengthen the amount of time it takes to complete a degree. Depending on your program's curriculum, the flexibility of your schedule, and time management skills, an online master's degree could take longer than two years to complete. Some master's in public safety administration programs offer cohort learning while others are individually paced. Cohort learning keeps all students enrolled in a course on the same timeline of assignments and deadlines. This often encourages more collaboration between students and instructors. A structure that is individually paced allows students to work at their own speed and meet course deadlines in way that fits their busy schedules. For students pursuing online degrees, it is important to attend a school that is regionally or nationally accredited. Of the two, regional accreditation is considered a more prestigious designation and is usually given to schools that offer a wider selection of academic programs and degrees. There are six regional accrediting agencies in the U.S. that are overseen by the U.S. Department of Education and Council for Higher Education Accreditation (CHEA). National accreditation is often given to schools that prepare students for particular trades or careers. Graduate programs in public safety and administration can also receive special accreditation from third-party agencies such as the Center for Public Safety Excellence. These types of special designations can be helpful in identifying high-quality programs. Before you choose a public safety administration program, be sure to verify that the school is nationally or regionally accredited. If you are uncertain about a school's accreditation status, you can find a list of accredited schools on the CHEA website. Students who earn an online master's in public safety administration can pursue a diverse set of career paths. Graduates with this degree often seek positions in public service, law enforcement, and emergency response, including administrative work for police or fire departments. Professionals in this line of work are often compassionate problem-solvers with strong interpersonal and leadership skills. They must also work well under stress and continually improve their effectiveness in the field. Workers in these positions work in a variety of settings, including offices, factories, and mines. They examine the workplace for environmental factors that could be harmful to employee health, safety, or performance. A master's degree is often necessary to work in specialized areas in this field. These directors put in place plans and procedures to mitigate natural disasters and other emergencies. Many professionals enter leadership roles during and after emergencies to coordinate efforts between public safety officials, government agencies, and nonprofit organizations. In addition to meeting certain personal and physical standards, professionals who work in law enforcement and as special agents need strong leadership skills. They may also work in potentially dangerous environments that require specialized training. A master's degree prepares you for leadership roles with local, state, and federal law enforcement. These professionals work in both the public and private sectors to manage daily operations, formulate policies, and plan the use of materials and human resources. They might also maintain facilities and supervise activities such as record keeping, external communications, and office upkeep. These professionals use their knowledge of the natural sciences to manage environmental protection agencies. In this role, you might supervise the cleaning and reclamation of polluted areas, help advise policy makers, or work toward reducing human impact on the environment. A degree in environmental science is usually required for this specialized area. No matter what career path you choose after earning your public safety administration degree, there is room for growth and high earning potential. Of the careers listed below, environmental health and safety managers have the highest earning potential throughout their careers. While public safety officers earn considerably less when they are not in supervisory positions, each of the professions listed belows shows consistent salary increases over time. In most cases, employees have also reported high levels of job satisfaction. When choosing the right online master's degree in public safety administration, be sure to explore all of the funding options available to you. Completing the Free Application for Federal Student Aid (FAFSA) will determine your eligibility for grants, scholarships, loans, and work-study awards. Since they are free, scholarships and grants should be prioritized over loans. Private funding options may also be available, although most private loans carry higher interest rates than those offered by the federal government.